Inhales Gas Because Her Plans Were Not All Successful. She Gladdened Many Little Hearts. Gave Her Time to Making Others Happy. 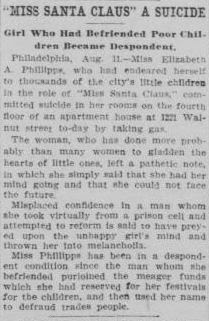 Assigning Poor Health As a Cause, Elizabeth A. Phillips Commits Suicide-Those Who Knew Her Best Say Her Rash Act Was Caused by Disappointment Due to Lack of Interest by the People. 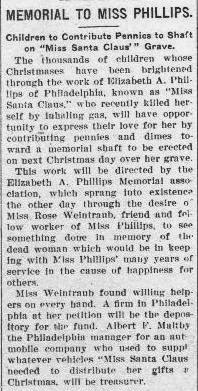 ‘Miss Santa Claus’ gave ill health as the cause for her suicide, but her friends say that the chief cause was the failure of her store, which she opened recently, the proceeds to go toward Christmas gifts to those children who wrote to Santa Claus but for whom there were likely to be few answers. But though ‘Miss Santa Claus’ is dead her work will live after her, a constant Christmas joy to thousands of little people for whom otherwise Christmas would have been but yet [another] pretty story to be enjoyed by the favored ones. For so thoroughly did ‘Miss Santa Claus’ plan touch the heartstrings of philanthropic persons throughout the country that the movement was established on a basis which provides for its future. Two years ago at her request all the letters written by children and mailed to Santa Claus were delivered to her by the Philadelphia postoffice. These she sorted, picking out those from children who seemed to be in danger of being forgotten and getting up on Christmas morning to find empty stockings. But she did not confine her good deeds to the holiday time. At any time in the year, day or night, when she heard of distress she endeavored to relieve it, and if she lacked the necessary means she at once appealed for aid. Last year, with the object of making her charitable work national in scope, she asked permission of the postmaster general to have all letters addressed to Santa Claus, from whatever source sent to her here, but the request was refused. That the suicide was premeditated was shown by the fact that the cracks of the door and window of the room had been carefully stopped by bedclothing. Note: I’m not sure why her surname is mentioned as “Stewart” midway through the article. The only information I found about Elizabeth was that she was 35, single, and her father’s name was F.R. Philips. 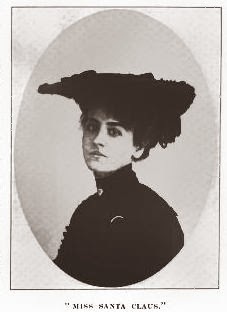 The Washington Herald suggested another factor contributing to Elizabeth’s decision to take her own life. “Misplaced confidence in a man whom she took virtually from a prison cell and attempted to reform is said to have preyed upon the unhappy girl’s mind and thrown her into melancholia. 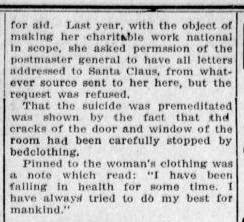 In addition to a number of other clippings about Elizabeth’s suicide and efforts to continue her work after her death, I stumbled upon this feature detailing her cause printed in a 1907 Harper’s Bazaar. *Originally posted in December 2013.